If you're tracking traffic and conversions for a website, you're almost certainly using the Google Analytics web analytics system to do so. Google Analytics measures sessions, user engagement, time on site, e-commerce transactions, sales/engagement goals and more for any website with its tracking code installed. Raven's Google Analytics integration dramatically simplifies the data coming out of your Google Analytics account, giving you the views you need and an intuitive design that makes understanding this data a breeze. When it comes to wowing clients with reports, the bottom line is... the bottom line. How has your online marketing work influenced key business goals? 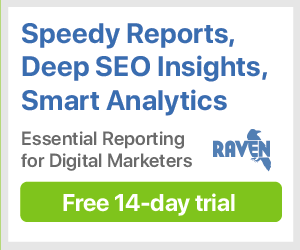 Use Raven's Google Analytics integration to make those connections obvious in your reports. With Raven's Reports, you can create a comprehensive Google Analytics report. Combine traffic, engagement and conversion data. Drill down into specific metrics to analyze your strategies. Then report high-level metrics to clients. And because you can manage unlimited Campaigns in Raven, that means you can report on unlimited Google Analytics accounts. Filter any existing Google Analytics report with advanced segments for more precise analysis. Or mix and match advanced segments to create custom charts and reports. Either way, you'll get deeper insight into what’s working best and where there are opportunities. If you want to monitor the status of key referral links but don’t have a dedicated link building team, Raven can help. Check the option to import referral link data from Google Analytics to Link Manager. It’s automatic up front, and you can edit link records manually later. Raven's Google Analytics integration gives you all of the data you need, right at your fingertips. Looking for something more specialized? Create a custom chart! Need ecommerce data? No problem! To get started, simply connect your Google Analytics account and we'll take it from there.